Most of us have experienced tucking into nine-course meals at wedding dinners for a table of ten or more— so for three of us to tackle nine thai dishes is definitely no mean feat. We were invited to a tasting session by Daryl, founder of GREAThai. The restaurant caters to the residents who live nearby, but I think their food is worth travelling for. I'm surprised that the restaurant is actually within walking distance from Great World City! 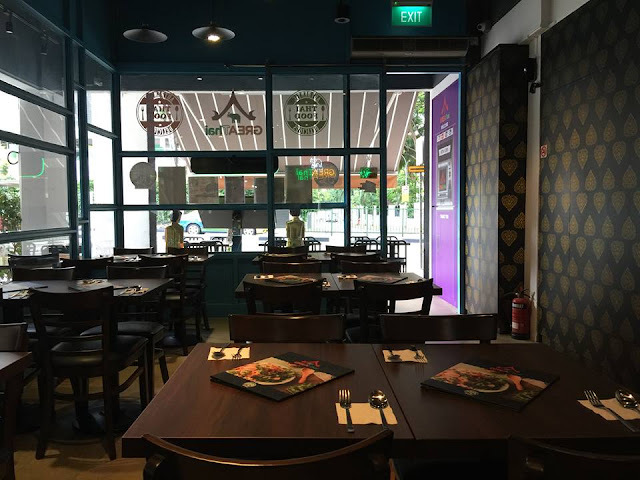 I was really excited to try GREAThai because my brother, who lives around River Valley area, shared that their food is really good. Sometimes, it is quite difficult to find great food places when you hang out with your muslim friends— so I'm happy to know that GREAThai is halal-certified. I stood outside admiring the beautiful, colourful decorations that were pretty much trademarks of Thai's architecture. We weren't sure if we had to wait to be seated, so we stood outside the restaurant for quite awhile. It was only after about five minutes that my partner and I decided to enter the restaurant, which was dimly-lit and had a really nice ambience. The wait staff, who eventually saw us, were quite friendly and showed us to our seats, introducing the various menu items. We asked them for their recommendations and the manager proceeded with keying the orders into an electronic iPad. Each strip of mango is evenly sliced, making every bite consistent and satisfying. The crunch of the riped mangoes are extremely welcoming to the palate, and my partner lamented about how surprised he was that this could taste so good. This is because we've tried many mango salad before and they're usually too sour, and this was in perfect balance. I wish they could replace Love Letters and spring rolls during Chinese New Year with these. Their homemade spring rolls are EXTREMELY crispy, yet juicy inside. You won't get sick of these, really. I had two of these (and secretly wished for more). When the stuffed chicken wings came, my stomach juices growled like no other. This is the signal of an awaken hungry monster, waiting to pounce on those wings! It was the first dish I devoured (after taking photographs and all), and it's definitely a must-order! Stuffed with fish paste, the chicken wings complements GREAThai's sweet chili sauce. Fellow blogger, Babette said that the snapper cooked in lemon sauce was one of his personal favourites. This flavourful dish is topped with lime, spices, chili and more. It was pretty fragrant and really fresh. The broth is excellent — combining strong citrusy flavours that eventually grow into a fiery flavour with each spoonful. Need your carbs? Make Phat Thai seafood your choice. I must applaud them for their efforts to clean the intestinal tract of the prawns and removing the shells— not many places do both together. It is a stellar dish, really flavourful and fragrant. One of my favourites is a simple yet hearty dish of thai pineapple fried rice. I always love how the different sweet and salty flavours combine together to form the dish— whoever discovered the combination of cashew nuts, pineapples and pork floss should be rewarded a Nobel prize! The texture of the rice was really excellent— not too mushy yet moist! 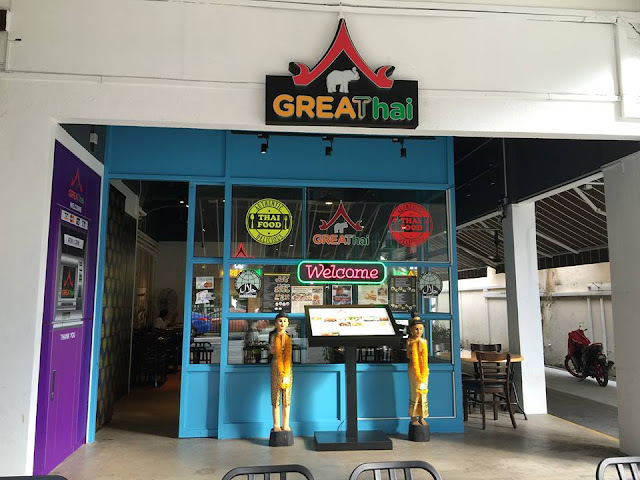 I wouldn't mind just stopping by for Thai Milk Tea at GREAThai. The sweetness of the condensed milk was not too overpowering, hence I could still taste the strong tea flavours. We feedback to the manager that the drink was too sweet— so you'd love this if you have a penchant for sweet drinks. Thanks Greathai for the tasting invitation! It was a really great dining experience.